Can Jimmy Butler come back and save the Timberwolves (again)? Any team would be better with Butler than without him, but here’s where the Wolves stand for the season: They’re 34-22 when he plays, and 10-12 when he doesn’t. The biggest problem with what on the surface has been a successful season-to-date is that improvement hasn’t come in the form of huge revelations leading to beautiful, cohesive basketball. Instead, the Wolves largely remain a tough team to watch — a strange phenomenon since they’re also winning at a better clip than they have in any season since 2003-04, which is also the last time they made the playoffs. An (almost) full season might not be the largest sample size, but it is meaningful enough to arrive at this conclusion: The Wolves are simply winning more games because they have better players than they had in past years. That’s neither a full-on complaint nor compliment. It’s just reality, and as such this past weekend brought both frustration and hope for Timberwolves fans. The frustration arrived in the form of a 121-97 loss to Utah at Target Center on Sunday. If this was the biggest game in (fill in the blank) years for the Wolves, they showed a sellout crowd all their inconsistencies and deficiencies. Playing without Jimmy Butler for the 16th game in a row, the Wolves again proved how much they miss their veteran star. They should be lightly applauded for doing the bare minimum without him (so far), going 8-8 in this stretch while Butler recovers from his knee injury and staying in prime position to at least make the playoffs in the crowded Western Conference. That’s a 50-win pace with Butler, and a 37-win pace without him. The Wolves were largely thought of as young underachievers last year when they went 31-51 in Tom Thibodeau’s first year. So he loaded up on veterans in the offseason, trading for Butler and nabbing Jeff Teague, Taj Gibson and Jamal Crawford in free agency. Teague also missed Sunday’s game, making the Wolves 6-6 when he’s absent. But the real catalyst is Butler, and therein lies the hope sprinkled into the weekend mix. Butler was cleared for contact, setting the stage for his potential return. Minnesota doesn’t play again until Thursday, in another game of massive importance at Denver. Butler simultaneously cannot be rushed and cannot get back soon enough, so it will be interesting to see when and if he does make his return. He’s rescued the Wolves more than once this year when they seemed to be teetering. When Minnesota was blown out twice early in the year when Butler was ill, he sparked a five-game winning streak upon returning. He almost single-handedly defeated Portland in mid-December, saving a homestand and launching another five-game winning streak. A team with Karl-Anthony Towns, Andrew Wiggins and plenty of veteran help shouldn’t be so dependent on Butler’s return, but here we are. 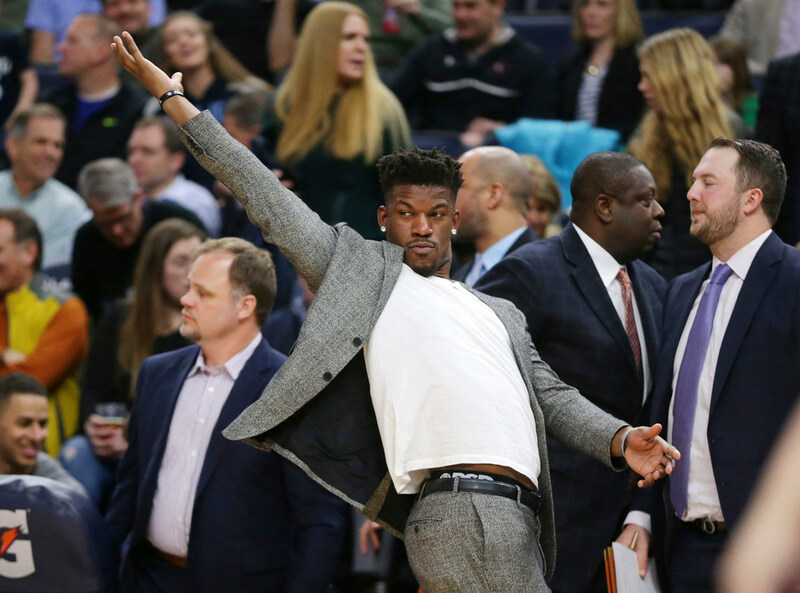 If the Wolves are going to meet my minimum requirement for a successful season — getting a playoff seed that sets up a winnable playoff series and at least winning two games in that series — they need Jimmy Buckets. Butler is the single greatest reason this team has improved this season, and it’s not even close. Maybe that’s frustrating, but right now it’s also a fact. We’ll see if he can save the Wolves again. Will the $1.1 billion Vikings stadium look like a bargain? Poll: Which team will make a better playoff run?